But when your mood is festive and the building magically shines like a beacon in the night, you start to notice things you never thought about before. The designers of the Lincoln Memorial knew what they were doing. Every feature has a reason, every nuance crafted with intent. The overall design of the Memorial should remind you of the formidable Greek temple, the Parthenon. Why are there states’ names carved along the outside facade? There are 36 states inscribed along the facade (called friezes), separated by double wreathed medallions. These friezes represent the 36 US states that existed at the time of Abraham Lincoln’s death on April 15, 1865. Each frieze also displays the date they became a state (in Roman numerals). Ernest C. Bairstow, an American architectural sculptor born in England, completed all the design work on the friezes (and the cornices above). He also did the interior letter engravings, the eagle lampposts on the Taft Bridge (Connecticut Avenue Bridge), and elements of the U.S. General Services Administration Building (now on the National Register of Historic Places). 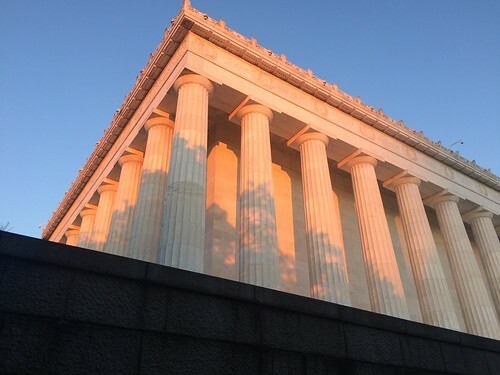 How many columns surround the Memorial? There are also 36 columns because they correspond to the states’ names (they are directly below each medallion). Why are there even more states carved along the top facade (the attic)? 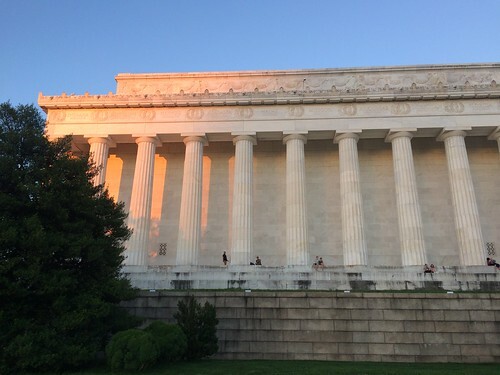 There are 48 states inscribed along the top, and these represent the number of US states that existed when the Lincoln Memorial was opened and dedicated in 1922. Only Alaska and Hawaii are missing, as they became states in 1959. What other random facts can we discuss? How tall would Lincoln be if he was standing (vs. sitting)? 28 feet! The seated version of the statue is 19 feet from head to toe. Is Lincoln signing his initials A and L with his hands (using American Sign Language)? The debate is on! Possible, but denied by the National Park Service. Why aren’t you at the Lincoln Memorial now? Hello, I am the great grand-daughter of Ernest C. Bairstow. Thank you for referencing him in your article! Sure thing! 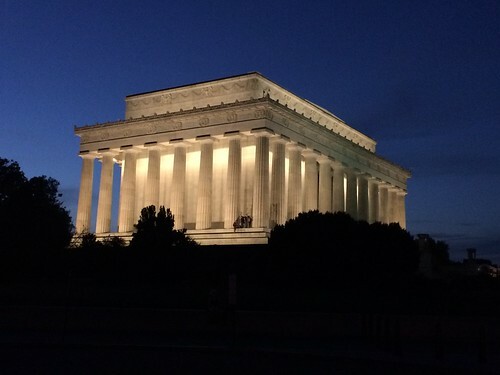 It’s cool to learn new things about DC and the Lincoln Memorial.